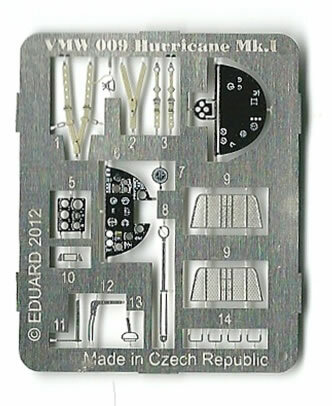 VWP007 – Eight resin parts.VWP008 – Thirteen resin parts. VWP009 – One coloured PE fret of nineteen parts.VWP010 – One coloured PE fret of twenty parts. Simple and well-executed, address key failings and detail opportunities, very good quality. Should suit brands other than just Airfix. These are all good quality sets. 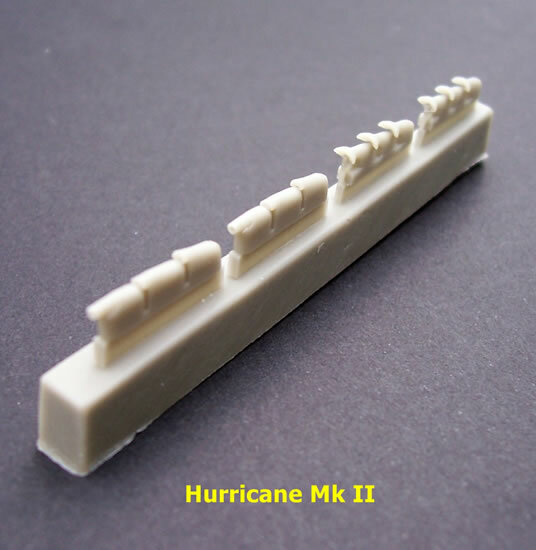 I have no doubt that that they will serve to improve the appearance of Airfix or other brand Hurricane kits. I am happy to recommend them. 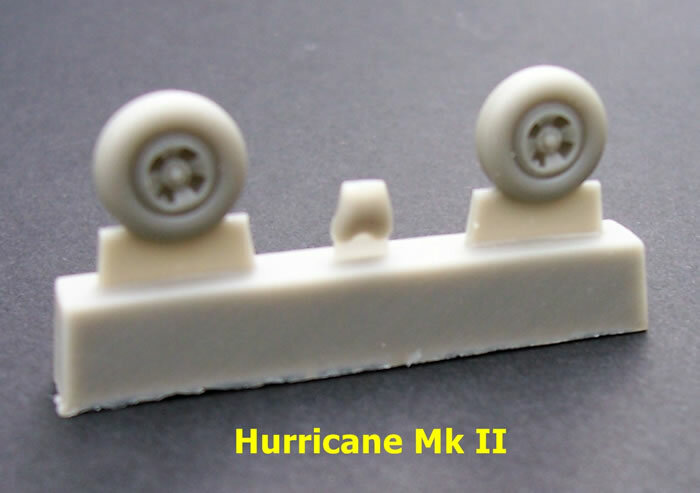 The old Airfix Hurricane Mk.I is a simple kit with basic detail but a generally good shape. 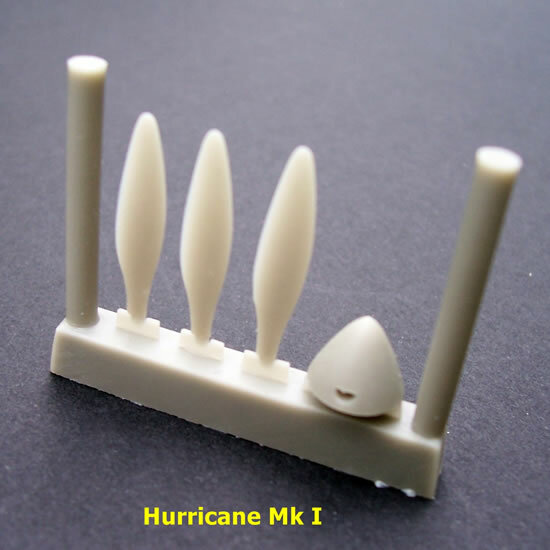 The new tool Airfix Hurricane Mk.II kit is much more modern in execution, but has a smattering of faults and failings. 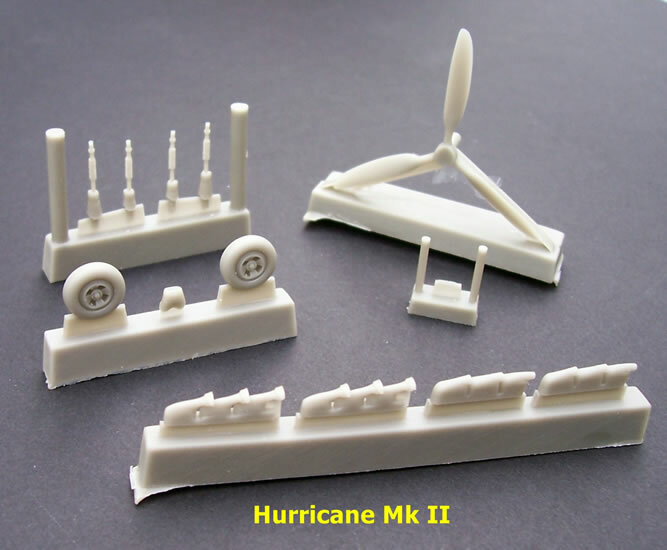 Both kits are comparatively cheap and readily available, so they are likely to prove popular choices for modellers of 1/72-scale Hurricanes. 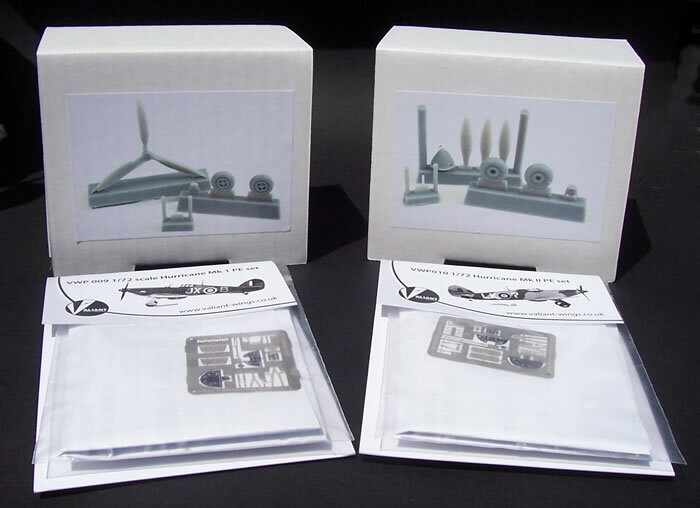 This has led valiant Wings to develop a two pairs of resin and PE enhancement sets for these kits. 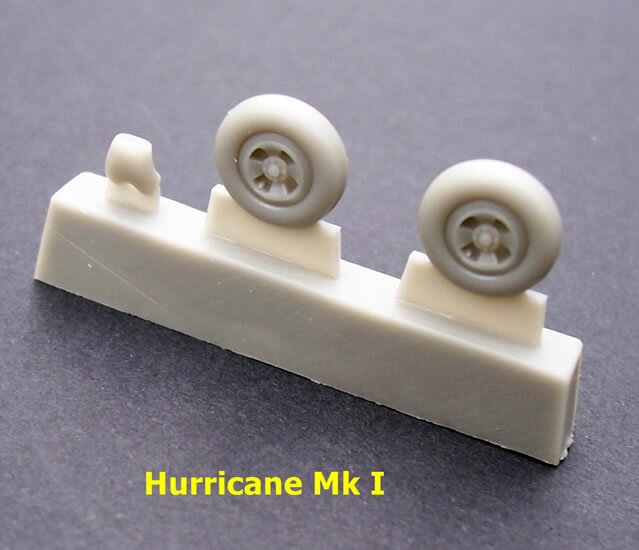 They should be suitable for other brands of 1/72-scale Hurricane kit with little if any modification needed. The resin sets come in rather large and sturdy cube-shaped card boxes with and image of their contents on the lid. These boxes remind me of those used by Obscuro, and like that company include a folded A-4 sheet of instructions. Actually, in these cases, the sheets are not so much instructions as an illustration of contents, along with an outline of their purpose and some guidance on removal of the parts from their casting blocks; and this is all that is required. The Mk.I set has replacement prop blades and spinner, main wheels, carburettor intake, and pitot. The Mk.II set has replacement prop blades, main wheels, carburettor intake, pitot, cannon barrels, and both straight and fish-tail exhausts. 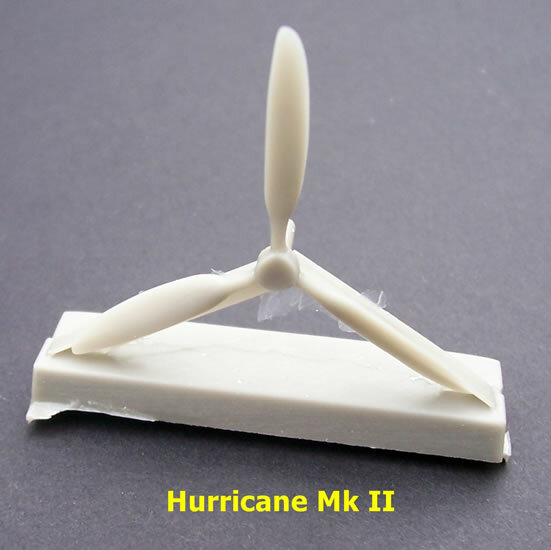 The resin is produced CMR Moulding & Casting as a large brand logo on the A4 sheet attests. The coloured PE sets come in a resealable plastic bag stapled to a card header, along with a folded A4 sheet illustrating the PE fret and a key to the parts. The text used in the resin sets is essentially repeated. Most will have no trouble using the PE parts, but some instructional guidance on the putting the four-piece harness together would possibly have been helpful. 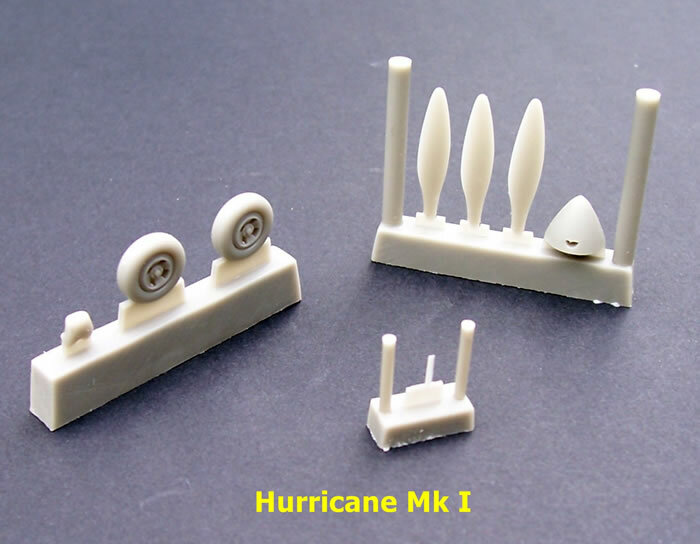 The two sets are very similar and contain an instrument panel, seat belts, inner and outer canopy handles, radiator matrix faces, rear view mirror, foot stirrup, pitot tube (early and late styles for MK.I), control column, and for the Mk.II a lock and rib for the undercarriage well. 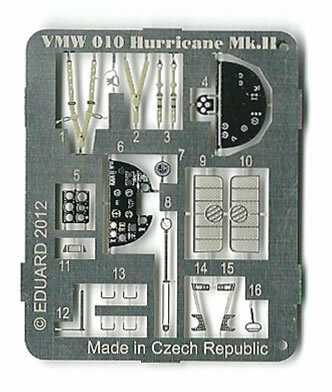 The PE is manufactured by Eduard, although the A4 sheets repeat the CMR logo. The quality of production of both the resin and PE sets is very good, as is to be expected of the two manufacturers concerned. These are all good quality sets. 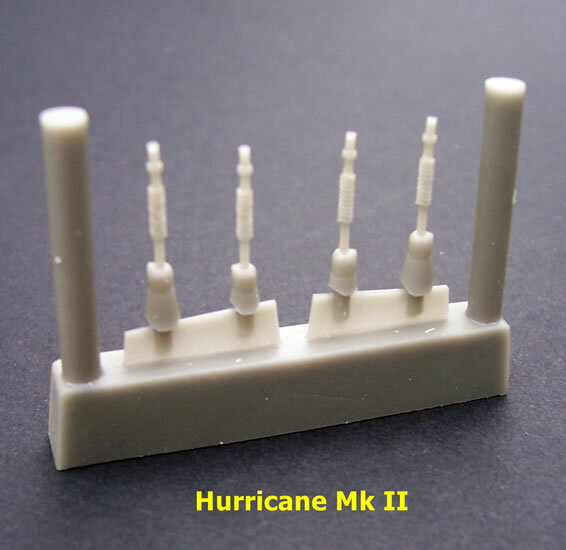 I have no doubt that that they will serve to improve the appearance of Airfix or other brand Hurricane kits.